An extraordinary week of presentations, forums, music, art and reflection on the prospects of creating a sustainable culture of peace. The Orphan Sponsorship Program (OSP) was launched in 2003 with the aim of making a postive difference in the lives of orphans around the globe. In just over 4 years, the OSP has fundraised over $200,000, allowing us to sponsor 100 orphans from 17 different countries! This year OSP is proud to host its first ever Fundraising Dinner to continue providing necessities for orphans worldwide. So come on out, bring your friends and family and join us on this occasion! TICKETS ARE LIMITED, SO HURRY BEFORE THEY'RE GONE! An extraordinary week of presentations, forums, music, art and reflection on the prospects of creating a sustainable culture of peace. 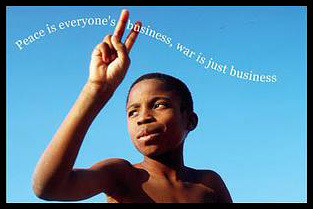 Peace Week is for everyone. It is to remember those who laid down their lives that we might live free. It is for the soldier wanted home and safe. It is for the terrorized and the agrieved. It is for the oppressor who knows not what they do and the oppressed who understand too well what is being done to them. It is a time for truth, for healing, sharing, aspiring toward a world of greater peace. The events of Peace Week are organized and presented by the following individuals and representatives of the following organizations: Hart House Social Justice Committee, Trinity Chaplain, U of T Graduate Students Union, U of T Lutheran Chaplain, U of T Sikh Chaplain, U of T Students Administrative Council and U of T Students of Science for Peace. Thank you to all those who showed up to the events, and to all those who helped administer them. We had a very successful Peace Week and hope to see you all next year. Make sure to keep checking the website for special events before the next Peace Week.